Hi Cavemen Gourmet fans! Sorry I haven’t posted in awhile, I just realized that my last post was the same week my husband and I found out we were expecting a little baby on the way. It’s been madness just getting our heads around the whole thing, but that’s no excuse and should mean more recipes for paleo parents and primal families from me. My goal for the rest of the year will be to come up with more fast, family friendly paleo recipes for you all and post more regularly (let’s see if that happens!). Here’s a simple four-ingredient recipe that’s tasty and reminds me of a summer day (and great for kids too!). In a blender or mixer, place the coconut milk with the banana and mix thoroughly. Because I like bits of pineapple and coconut flakes, I wait until after those two are mixed before I add the coconut flakes and crushed pineapple, as to not liquify them too much. One all four ingredients are thoroughly mixed together, pour it in an ice cream mold of your choice (I happen to use the Zoku because it was a lovely gift but you can use any simple popsicle mold). Keep frozen for several hours and ta-da! 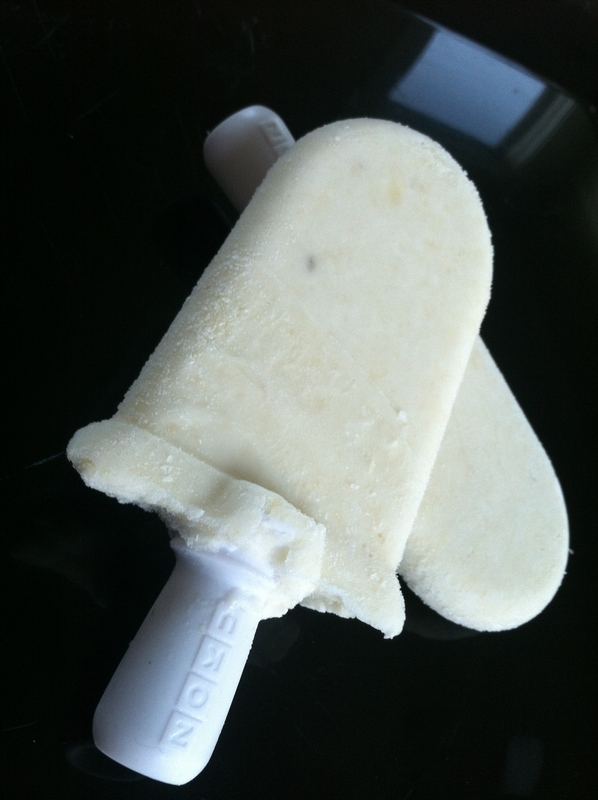 You’re ready to enjoy this pina colada popsicle! I had some leftover mixture so I just put it in the fridge and it was great as a chilled, decadent pudding as well. Enjoy!